As we start another year, we look back at 2017 with sincere gratitude. 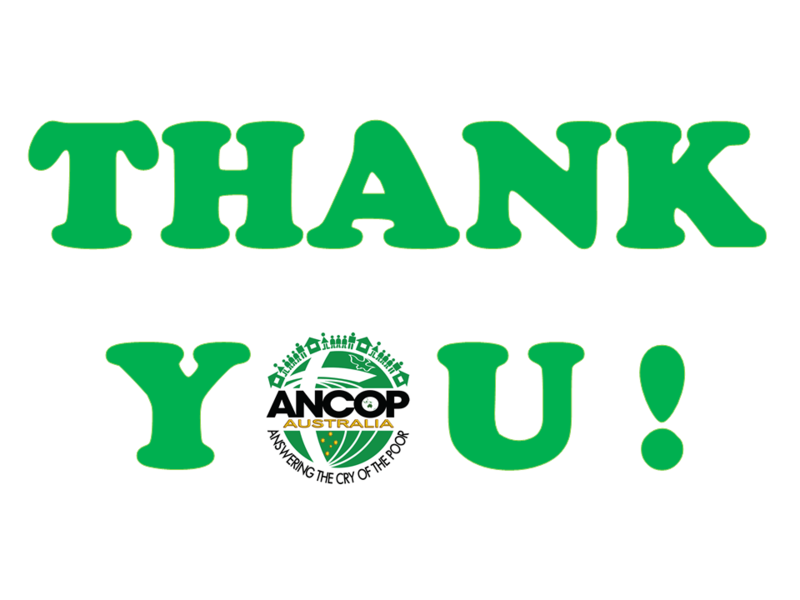 We thank all of you who supported ANCOP’s mission with the poor. We are blessed to have new commercial partners as well as having solid support from existing external relationships. We are also grateful for new volunteers joining on their own initiatives to raise funds for our work. In 2017 we had seen a surge of kind-hearted individuals setting up their own ANCOP fund raising sites in the various fun run events throughout the year. Their generosities were doubly matched by donations from their families, friends and colleagues. These fun runs fuelled about 25% of the funds received last year to sustain our work. We were also pleasantly surprised by the outpour of donations from different activities such as movie events, birthday celebrations, garage sale, cook out, and others. We treasure these events as they also raised awareness out to a bigger audience of the work that we do. Combined with the regular donations from those who pledged towards the continuous education of our beneficiaries, these generous labours accounted 47% of our cash inflow last year. Lastly, we had our biennial car raffle event last year which generated the remaining 28% of our inflow of funds last year. For everyone who supported our mission through their labour, talent, treasures and prayers, and for our unsung hero-volunteers on the ground who help us run our work in our beneficiary areas, please accept our sincere gratitude and prayers. With these, ANCOP was able to sustain its work of providing hope through education. In 2017, our partnership of shared scholarship grant with Don Bosco Technological Institute in Port Moresby, Papua New Guinea (PNG) officially materialised with seven ANCOP students enrolling in a technical and vocational course of their choice. We also started sponsoring the training of 20 women in Lae, PNG, to a sewing class which they finished in May 2017. With an average age of 40 and educational attainment of Year 9, these women are now inspiration to others that it’s never too late to acquire new skills and become productive members of the community. Shortly after their graduation, a school already contracted them to sew uniforms for students and staff and after that, towards the end of last year, they’ve been engaged by a cement factory to sew cement bags. Yet despite being busy using their new trade for livelihood, these women are so willing to share their blessings and are even volunteering to teach anyone who are wanting to learn the same skill. Finally, last year we also sponsored the cost of schooling for an additional 48 children in the orphanage of St Martin de Porres in Bulacan, Philippines. This came about after a number of ANCOP volunteers from different states of Australia had an immersion program in the Philippines in January 2017 and had an encounter with our scholars there, as well as their teachers, carers and administrators of the place. The orphanage is home to abandoned and endangered children who end up to be “street kids” of some of Metro Manila’s most notorious cities. The orphanage, about 67 kilometres south of Manila, runs its own school to deter these children from running away again and going back to their old dangerous lives. Thanks to you, our work goes on and many lives continue to weave better and beautiful stories. We look forward to working with all of you again in 2018. May God bless you all as you allow yourselves to be channels of blessings for others.